Quilt made from baby clothes. We do 'Tiny T-Shirt' quilts all the time. You get all these cute little outfits when the new baby comes, and well into the toddler years. What can you do with all these items of clothing? 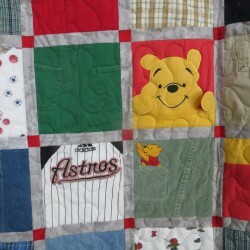 You are used to seeing t-shirt quilts made from larger sized clothing. Well, what do you do when ALL of the clothing is miniature in size? 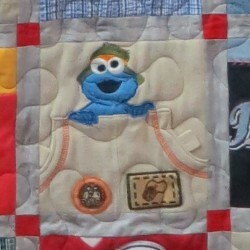 You scale the entire quilt down to be in proportion of the smaller size. These blocks are 7", still includes the sashing and borders. 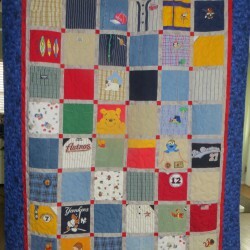 What a cute quilt for a little boy to grow up with? We 'fussy cut' one block from each piece of clothing. This one featured used 48 blocks. Sometimes we can use the back of the clothing for a 2nd block if needed. (Note the block in the top left corner and the block 3rd row, 3rd column). We lay out the blocks in a pleasing manner and create a nice sized throw. We also do this same quilt in a smaller version with 35 blocks. These quilts are made with top quality materials and will last a lifetime. Oh, and the memories! Gather up all those outfits from 'onesies', overalls, pants, shirts and blankets (we can get a lot of 'filler' blocks from blankets if needed). Make sure the clothing is freshly laundered if they have been stored for awhile (musty smelling clothes will result in a musty smelling quilt!) If there is some spit-up stains on the clothing, don't worry about it. It won't even be noticed and might even get trimmed off when creating the block, so don't worry about it. Box up the shirts if you are mailing the clothing, (or in a bag if coming to the shop). Once we receive the shirts, we look everything over and help select fabrics that complement the clothing. In this case, a little boy, baseball, denim, plaids - you can guess the rest. Make sure you fill out the order form, pack it securely and let us know it is coming. We will let you know after it arrives and give you an idea of when you can expect the finished quilt. For more information on PACKING your t-shirts or clothing click here.